It happened very much as it did in the 18th century - which Werner Egk considered a kind of spiritual home - where a composer wrote for an ensemble at hand. 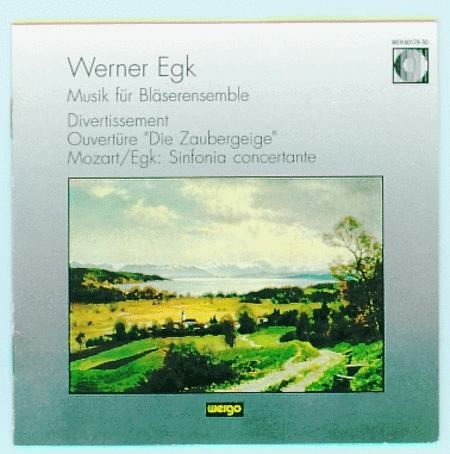 It was under such circumstances that Egk composed the â€œDivertissementâ€ (1973-74) for eleven winds, the version for winds (1980) of the overture to his early opera â€œDie Zaubergeigeâ€ (The Magic Violin), and the arrangement of Mozart's â€œSinfonia concertanteâ€ in E-flat KV 297b, his last work. The musicians who inspired Egk in these three scores were Klaus Rainer Scholl and the Wind Ensemble of Mainz which Scholl founded in 1967. 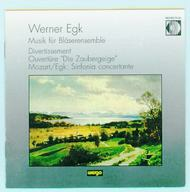 It is said that Werner Egk had to be persuaded to write music of an intimate character; in his long list of works chamber music plays the smallest role, being limited to the Piano Sonata of 1947 and two pieces for winds dating from the 1970s.